Welsh golfer Becky Morgan waited 18 years for her first professional title - and has followed it up by becoming Wales Golf Tour Professional of the Year for the first time. Morgan received the award in a 2018 Welsh Golf Awards at the 2010 Clubhouse at Ryder Cup venue Celtic Manor. Winning the Hero Women's Indian Open on the Ladies European Tour (LET) in October, 2018 was her career highlight. The 44-year-old has Morgan had 40 top-10 finishes. Those success have been split between Ladies Professional Golf Association between and the LET. "You have to be a really good player to last as long as she has in the professional ranks," said Wales Golf chief executive Richard Dixon. "Her win in India has been a while coming, but she had an excellent amateur career and you have to be a really good player to last as long as she has in the professional ranks. 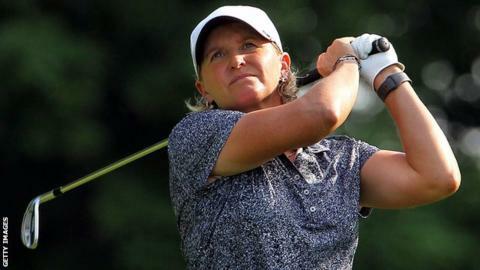 "She is one of the few Welsh professionals to have played full time on Tour in America, after winning 10 NCAA titles while at college in the US. "We were very proud of her amateur achievements and equally proud of her professional record." Morgan's stellar amateur career included two Curtis Cup appearances, two Vagliano Trophy appearances, all for GB&I, along with runner-up finishes in the British Ladies Amateur Championship, British Ladies Stroke Play Championship and the Welsh Amateur Championship. Junior Club of the Year: Cardigan. "It is a remarkable list of winners once again, choosing the recipients each year is getting harder and harder because of the quality of the applications," said Dixon. "For instance, 2018 probably saw the strongest ever set of applicants for the Welsh Golf Club of the Year, with Cardigan, Clyne, North Wales, Llanishen, Lakeside, Garthmyl and former winners Langland Bay being shortlisted. "The strength of players coming through is shown by the likes of Archie, Carys and Jake, while congratulations must also go to Cardigan, John and David for their well-deserved awards."